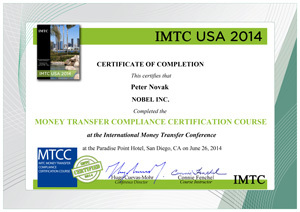 We certify that the following individuals took the Money Transfer / Money Transmitter / Money Service Business Compliance Certification Course – MTCC – and successfully passed the Online Certification Test which granted them a Certificate of Completion. Download this PDF of the MTCC Course for your files. * Our course curriculum varies in order to include the laws, regulations, requirements and practices of the country/region where the course is given examining the instances where there are differences with the international standards.